To tell the truth, I can’t exactly remember how I arrived at this tiny cobblestoned village capping a hill in Tuscany one day in mid-February. There must have been an overnight flight. Oh, yes, that was the time the Delta flight attendants turned on the lights about two hours before landing in order to serve orange juice and stale pastries – and ensure no one got more than a couple hours of sleep during the eight hour trip between Boston and Rome. After a blur of meeting up with other journalists jetting in from various places, drinking the welcome true espresso you can even get in an airport in Italy, and finding a bancomat for some Euros (not easy to negotiate on a combination of jetlag and espresso) we somehow found ourselves being driven along a highway by one of the many shaved-head, cellphone-wielding young dudes that are thickly sprinkled along the city streets of Europe these days. Yet all went well: a few hours later we were ensconced in the quaint, small rooms of a former olive mill converted into a hotel (Hotel Vecchia Oliviera), set in the ancient walls of the town of Montalcino, with panoramic vistas over the fields and vineyards leading up to the hilltop perch of this ancient village. The next couple days were filled with strolls and climbs over uneven cobblestones up and down the hills, into charming restaurants such as La Porta, Re di Macchia and Locanda Buca di Bacco. (Looking at their cards now, I find each one conveniently lists the days they are closed; beware of Thursdays in Montalcino). To get in the mood – and to preserve it during and after the tasting – we sampled quite a few different Brunello and Rosso di Montalcino wines, along with the finest herbed and spiced salamis I’ve ever encountered and several excellent versions of the local winter specialty, pasta with cinghiale (wild boar). This was a tasting of the 1999 vintage Brunello (and 2002 Rosso di Montalcino) that featured 131 producers and ran over one and half days. Around 150 journalists from around the globe attended the tasting, and a gala dinner at the scenic and beautifully-lit Castello Banfi (pictured right).A final awards presentation and luncheon in the picturesque hilltop town of Montalcino in Italy’s captivating Tuscany region rounded-off a spectacular few days. To make this ordeal a litle easier, personal service was provided by formally-dressed wine stewards with long white aprons and shiny tastevins, all members of Italy’s wine and restaurant service guild, who fetched sparkling clean glasses with fresh pours of every wine we requested. We writers industriously swirled, sniffed, sipped, spat and made notes, seated upon black bentwood chairs at white linen covered tables-for-one, in a gigantic white tent heated against the February chill. The floor was covered with red carpeting and little sockets for discreet laptop power supply for all. On each table was a white plate, periodically replenished with slices of unsalted Tuscan bread and crisp, neutral crackers, as well as individual bottles of water, fizzy or still, depending on one’s preference. In case we chose to interact with the winemakers, we had only to walk past a line of potted plants to rows of tables where the wines were displayed, and animated Italians were having a great time catching up on each other’s news. They would most courteously break off their conversations to chat with those in the press who ambled by, taking a break from tasting or searching for more information and inspiration – then immediately continue on with their own exciting lives as soon as the writer departed. Very Italian, and lots of fun. As Brunello di Montalcino DOCG status requires a minimum of 4 years’ aging, 1999 is the current release. As you may know, 1999 was considered a very good year for Brunello, rated four stars (out of five) by the Consorzio del Vino Brunello di Montalcino. This is better than 2000 (three stars) but not as good as 1997 or 2001 (both five stars). While we were celebrating the release of the 1999s, the 2003 vintage was rated, and despite the difficult summer in many parts of Europe, last year’s Montalcino harvest was given the high mark of four stars (see the ratings at the Consorzio del Vino Brunello di Montalcino website). But that’s for the future. Right now, there are plenty of big 1999 vintage wines that will be coming into their own in the next year or two, and will remain drinkable for at least 5 years, and often much longer. Located in Tuscany’s sangiovese-growing region, Brunello di Montalcino is the only wine required to be made entirely, and only, from the sangiovese grape. Brunello di Montalcino was one of the first half-dozen wines to be awarded DOCG (Denominazione di Origine Controllata e Guarantita) status, in 1980. Brunello’s DOC certificate had been granted in 1966; it was one of the first reds to be recognised, only three years after Italy’s DOC program had been created. Visiting Montalcino is like entering the landscape of an Italian Renaissance painting. The tiny town still has much of its encircling walls intact. Though there are now charming wine shops, wine bars and small hotels along each of the curving and dipping main thoroughfares, tourism has not completely taken over the town. Most vineyards are on hillsides near, and leading up to the town, at altitudes from around 500 to 1800 feet. Though adjacent to the Chianti region, this area is closer to the Mediterranean on the west, and protected from southern storms by a nearby mountain. The vines grow in a slightly milder climate, where the special Brunello clone of sangiovese can fully ripen, and producers do not need any blending grapes to make great wine. Wine-making has been documented in Montalcino since the 14th century, however it was only in the late 1800s that the current Brunello style was developed by the prominent Biondi Santi family (Jacopo and Franco Biondi Santi, left).They planted Sangiovese grosso grapes and departed from accepted practices by aging their wines for many years – and they were very successful. Since that time, Brunello di Montalcino has been aged for many years before release. In fact, the ageability of Brunello di Montalcino is legendary; it is considered the longest aging wine in Italy. In recent years, regulations have been modified so that Brunellos are required to have only four years of aging – and only two in oak – before release. Riservas must be aged a total of five years, and half of that must be in oak. 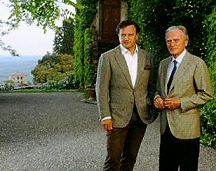 Until after the second world war, the Biondi Santis were the exclusive producers of Brunello. The family has remained very highly-regarded producers of Brunello di Montalcino to this day, but they had a difference of opinion [which was not explained to me] somewhere along the way, and decided not to participate in the local regulatory organization, the Consorzio Del Vino Brunello di Montalcino, for some time. Happily, this issue has just recently been resolved, and as of this winter, Brunello’s consorzio now boasts that it is the only one in Italy with 100% membership for its region’s producers. While trying not to be influenced by the surroundings and the myriad of journalists from many countries all seriously sipping and studiously scribbling notes – as well as by the good-looking sommeliers at my beck and call – I managed to industriously taste many of the wines exported to the UK and US. Altesino, Argiano, Ciacci Piccolomini d’Aragona, Fanti, La Fortuna, La Serena, La Togata , Siro Pacenti, Talenti, Tenuta Caparzo, Tenuta la Fuga, Uccelleria, Villa Poggio Salvi (from Biondi Santi). Campogiovanni, Casanuova delle Cerbaie, Castello di Camilgliano, Fuligni, Il Poggione, La Colombina, La Gerla, Sesti, Tenute Silvio Nardi, Valdicava. The word “Brunello” is thought to be an affectionate tribute to the deep color of the wine made from this Sangiovese clone. The modern style 1999 Brunellos are developing splendidly, and should be ready for drinking in a year or two. We can expect these wines to be beautifully drinkable for at least five to ten years after that – and often much longer. Aromas are hearty and meaty and sometimes smoky, followed by big fruit flavors that can be plumy or perfumed, and woody tannins just now hinting at future integration. The finished wine is profound, powerful and long-lasting, both in the bottle and in the mouth. Banfi, Poggio Alle Mura (Banfi), Fanti, Fastelli, Fuglini, Il Poggione, La Serena, La Togata, Latogata Dei Togate (La Togata), La Torre, Mastrojanni, Pian delle Vigne, Poggio di Sotto, Poggio San Polo Tenuta Caparzo, Tenute Silvio Nardi, Tiezzi, Valdicava, Vigna La Casa, Villa Poggio Salvi. Abbaddia Ardenga, Agricola Centolani, Altesino, Campogiovanni, Canneta, Casanuova delle Cerbaie, Castello di Cerbaie, Ciacci Piccolomini d’Aragona, La Gerla, Tenuta La Fuga, Uccelleria. Unfortunately I was able to sample very little of the 1998 Brunello di Montalcino Riserva, a four-star year for the regular Brunello. Nearly all I tasted were excellent, including wines from Sesti and Talenti. 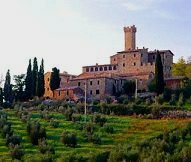 Hints on the 2003 Brunello di Montalcino: some producers had brought the new vintage to taste, and it looks very promising, judging by samples from wineries such as Siro Pacenti, Altesino, Banfi, Castello di Camigliano, Il Poggione and La Gerla.